A while ago we asked our forum members to spec a gyuto that they would like to see on our site. At the time the blacksmith was kept a secret! It was a fun interchange of ideas and out of this meeting of the minds came four knives. The blacksmith in question is Gabe Mabry of the Doberman Forge, located in Albemarle, North Carolina. And we now present the second of these beautiful creations. 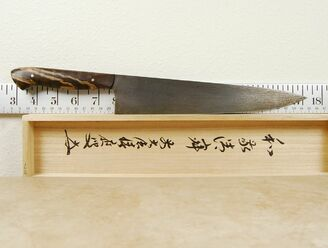 This 240mm gyuto is the same shape as the others but has a much thinner grind. It is the closest to being a laser. They are all mono steel constructions using the highly regarded 52100 ball bearing steel. This was chosen as the preferred steel by our forum members in a poll taken earlier this year. 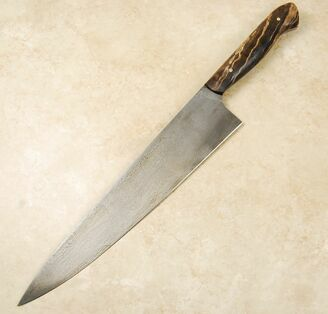 The basic profile is that of a standard gyuto but with a slightly straighter spine, which raises the tip and thus creates a more rounded edge from the mid-point on. There is a nice flat area from the heel for the push cutters out there. The knife has a full tang which is beautifully shaped to allow for a very comfortable and attractively sculpted handle, in this case made from a double-dyed burl with copper pins. 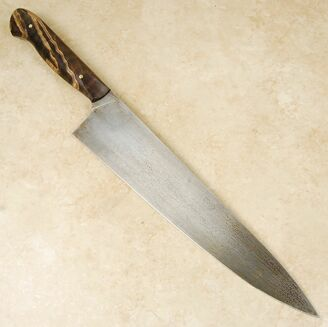 The blade is finished to an extremely high standard as is the handle, resulting in a very unique knife package made for you by a true artisan of the forge.